Posted by John Ruby in Accessories, Computers, Hardware, Tablet. We loved the original Pacemaker, and were sad to hear of its eventual discontinuation. News just in this morning, however, is that the DJ tool is back as a PlayBook app thanks to an exclusive collaboration with the tablet’s maker. Details are sparse right now, as the information spilled at RIM’s event this morning at MWC, but we do know that there will be auto beatmatching, vinyl mode with scratching, digital mode, looping, loop travel, pitch control, beat skip and "pro level" effects. All we have in terms of availability is that it will be out this spring, with no word on price. In the meantime we’re going to start prepping up that music collection. Posted by John Ruby in Computers, Slate, Tablet. 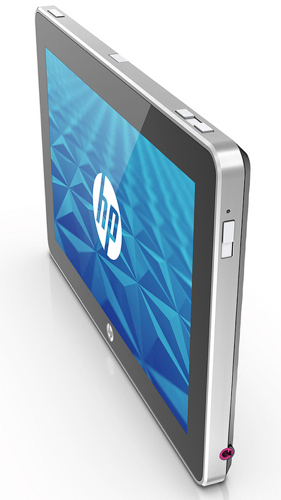 HP Slate to cost $549, have 1.6GHz Atom Z530, 5 hour battery? Well, well — what’s this? 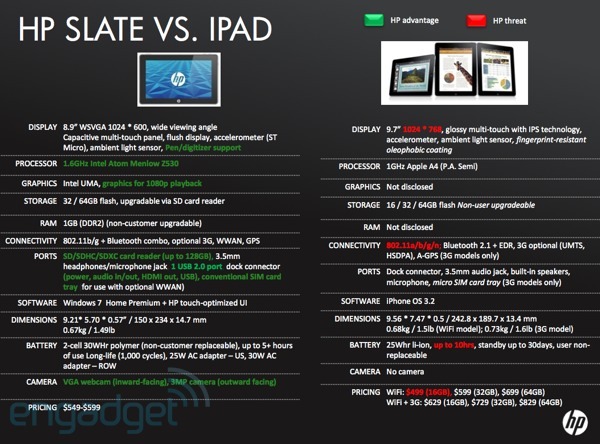 We just got our hands on what looks like an internal HP Slate presentation given to cool down some of the iPad hype amongst HP employees, and it just happens to have specs and pricing details on the elusive Windows 7 tablet. 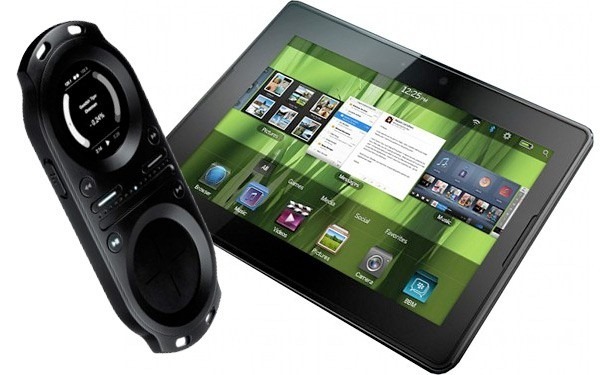 As we’d heard, the Slate will run $549 in its base configuration, which has a 8.9-inch 1024 x 600 capacitive multitouch display, a 1.6GHz Atom Z530 processor with UMA graphics and an accelerator for 1080p video playback (we’re assuming it’s a Broadcom Crystal HD chip), 32GB of flash storage and 1GB of non-upgradeable RAM. There’s also a $599 version with 64GB of storage, and both models will have a five-hour battery, an SDHC slot, two camera, a USB port, a SIM card slot for the optional 3G modem, and a dock connector for power, audio, and HDMI out. Of course, what this spec list doesn’t cover is software, and we still haven’t seen much of how HP plans to make Windows 7 on a full slate device with netbook-class internals perform as smoothly or as intuitively as its demo videos. That’s not a small challenge, especially since the iPad is out now and setting some pretty high expectations for how this new breed of tablets should work. We’ve got our fingers crossed — show us something good, HP. Posted by John Ruby in Computers, Hardware, Slate, Tablet. 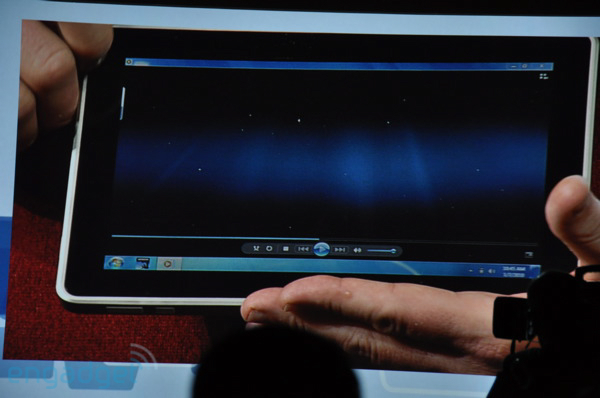 Here we go — press images of the HP Slate just hit the web, right as Ballmer showed it off during his CES keynote. 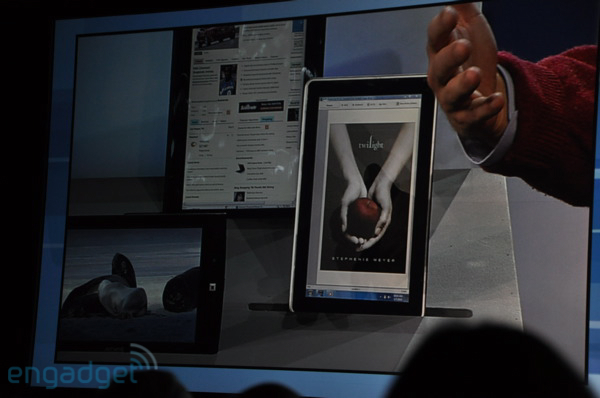 The prototype device is said to be coming later this year, and it’s running Windows — Ballmer showed it running the PC Kindle app. It’s also multitouch, and can do some gaming — they showed it playing Frogger. Check one more pic and the teaser vid after the break. And trust us — we’re going to find out everything about this thing before we’re done.